"... et invenerunt Mariam et Joseph, et infantem positum in praesepio." As the new liturgical year unfolds and the calendar year closes, we at Regina Caeli Parish have much to be thankful for. We are officially a parish, and God willing, with the help of Our Blessed Mother and St. Joseph, we will soon enter the next stage: the launching of a capital campaign and the construction of our own parish complex. This Christmas, the parish received a special gift of the nativity set shown above. It will grace the FLC until Candlemas 2014, which marks the end of the Christmas season. In addition to the new nativity set, there was another pleasant surprise. At the Christmas Eve Midnight Mass, the schola, now in cassock and surplice, permanently moved from the back of the FLC room to the Gospel side of the altar. December 22, 2013. Fr. 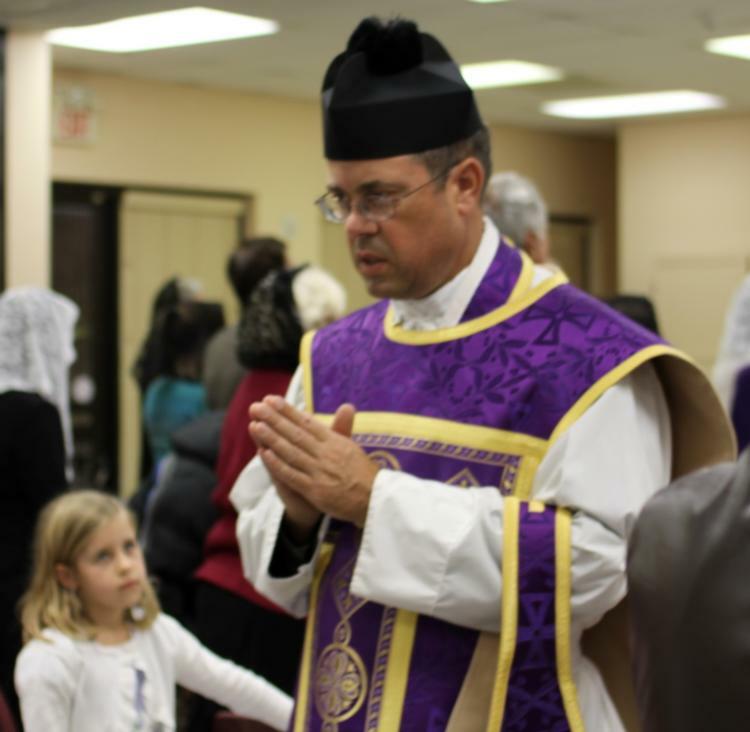 Michael Stinson, FSSP, was the last visitor to our parish in 2013. Our pastor was called out of town, and since Fr. Stinson was visiting family nearby, he volunteered to celebrate the Sunday Masses. Read About Fr. Michael Stinson at the bottom of the page under Documents. The way the holidays and Holy Days fell, there was only one CCD class in the month. "It&apos;s great to be Catholic," Father quipped, and the children probably agreed. Sunday, December 8, was the Feast of the Immaculate Conception. After the High Mass, CCD children gathered around a statue of Our Lady and led the singing of Immaculate Mary, after which, there was a party in her honor. The next Sunday, CCD classes were held, but after the Low Mass, there was another party for Our Blessed Mother. This Advent party celebrated Our Lady of Guadalupe, whose feast day is December 12. For this party, there was Mexican hot chocolate and pastries, and taped mariachi music. Saturday, October 26, was Fr. Van Vliet&apos;s birthday. His birthday wish? A hard day&apos;s work at the site with the volunteer crews. The crews accommodated, working until supper and a bit after, creating a clearing for the farmland and fences where the animals will be contained when not grazing the open acreage. Supper was hot dogs and hamburgers cooked on a open grill at the site, and a rich homemade chocolate cake with lots (and lots) of trick candles. The party ended with the ringing of the Angelus bells at 6 p.m.
". . . Mater plena sanctae laetitiae." That morning, greeted by pounding rain, the question on everyone&apos;s mind was, "Will the Procession be postponed?" Father was convinced otherwise, and he was right: the sun broke through shortly before noon, making for a perfect afternoon to honor Our Lady. Once at the site, a new concern arose: "Where is Our Lady?" The statue, arriving fashionably late, was quickly adorned with a beautiful crown and flowers at her feet. During the Procession, the rosary was prayed in Latin, English and Spanish. The path was longer than last year, but still ended at the St. Joseph statue for final prayers and a blessing. Good food and great fun followed into the evening. More pictures at Rosary Procession, 2013 Photo Album at the top of the page. "For the bells are the voice of the church"
~ Longfellow, "Bells of San Blas"
St. Gerard Majella is ringing in the Angelus! Arriving July 15, the poor bell had to sit quietly in its shipping crate, waiting for a temporary home to be built. The work crews, under Father&apos;s guidance, built a tower in stages, completing the main body and hoisting the bell in time for the Rosary Procession on October 6. Work and painting on the tower continues. A section was recently added to the back that will contain a shower for use by the crews. The men also constructed an outdoor wash basin. quae omnium portasti Creatorem ...."
CCD kicked off with a celebration of the birth of Our Lady. After Father lead the prayers and blessed the food, he was given a parish gift from the LeBlancs: the Certificate of Recognition from the City of Houston, now beautifully framed. 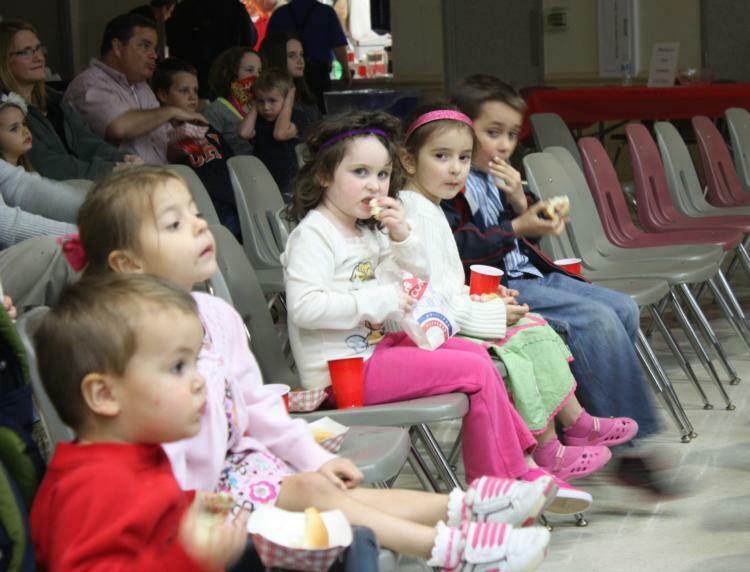 Everyone enjoyed the extra time to visit before a shortened CCD class, most especially the children. More than sixty children enrolled in the program - a 50% increase over last year! Called for by Pope Francis on Sept. 4 for peace in Syria and the Mideast. Our first and second baptisms as a newly established parish! Congratulations to the Strubing and Botthoff Families! There were eight baptisms prior to our being formally established, and these were registered under the name of our host parish. Congratulations to all the families! Read about Baptism in the Traditional Rite. Regina Caeli Parish Officially Established! 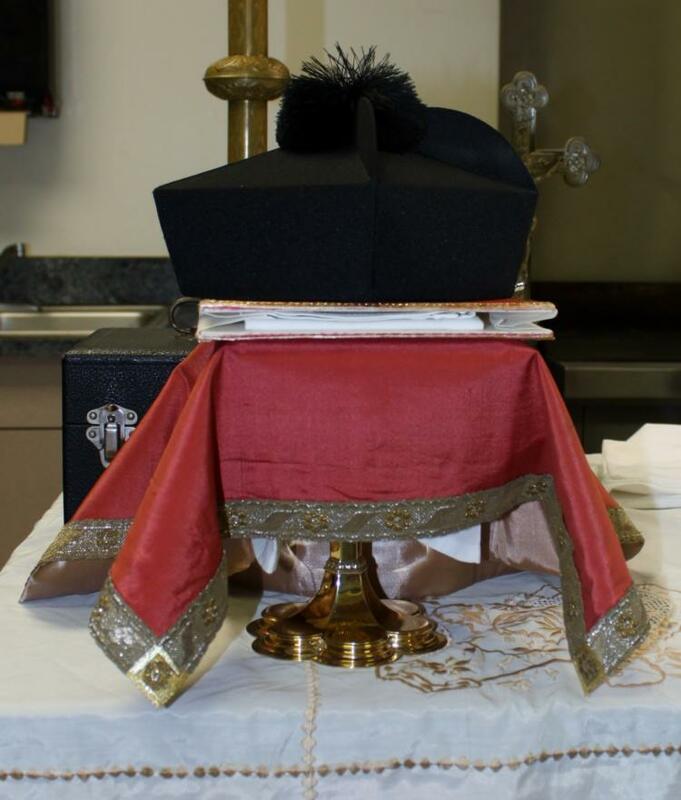 with religious submission of will and intellect ...."
Over 330 witnessed, with great joy, the installation of Fr. Van Vliet as Founding Pastor of the newly erected Regina Caeli Parish. Deo Gratias! The day we had hoped for, prayed for, longed for had finally arrived! Msgr. Daniel Scheel, E.V. represented the Archdiocese and to him, Fr. Brendan Cahill, Director of Clergy Formation and Chaplaincy Services, presented Fr. Van Vliet as worthy of the position of pastor. The Feast of the Assumption of the Blessed Virgin Mary was chosen by His Eminence, Daniel Cardinal DiNardo as an appropriate start date for a parish named after Our Lady. The High Mass that followed the installation ceremony was flawlessly executed by the altar servers, under the direction of FSSP seminarian Mr. Michael Malain, and was beautifully accompanied by the parish Schola. To handle the large number of supporters, the Mass was moved to the larger Community Life Center; even so, it was packed, and the responses of the faithful echoed through the hall. Fr. Van Vliet, in his sermon, gave the three reasons why people fear death, and why Our Lady - and we, if we follow her example - need not. The reception was held in the Family Life Center and additional tables were set up outside in the courtyard. With plenty of good food and high spirits, the celebrating lasted to the late hours. Council Member Helena Brown presented Fr. Van Vliet with a Certificate of Recognition by the City of Houston and Michael Charba gave him the perfect present from the parish: funds for the tool(s) of his choice! Father surprised the parish with an original oil painting of the Assumption by Caroline Allbee, a local artist, and Juana Marie Olvera surprised all of us by adding the parish shield to the communion rail cloth. The parish is grateful to Cardinal DiNardo for his benevolence. Special thanks to all the parishioners who helped make the day even more glorious and joyful. There are too many to name, but each of you did God and our pastor proud. More pictures at Installation/Opening Mass 2013 Photo Album located at the top of the page. July 30 - August 13, 2013. Last year, Fr. Van Vliet took several work-related trips, but this year, he planned only one: a well-deserved vacation to see family in Canada. 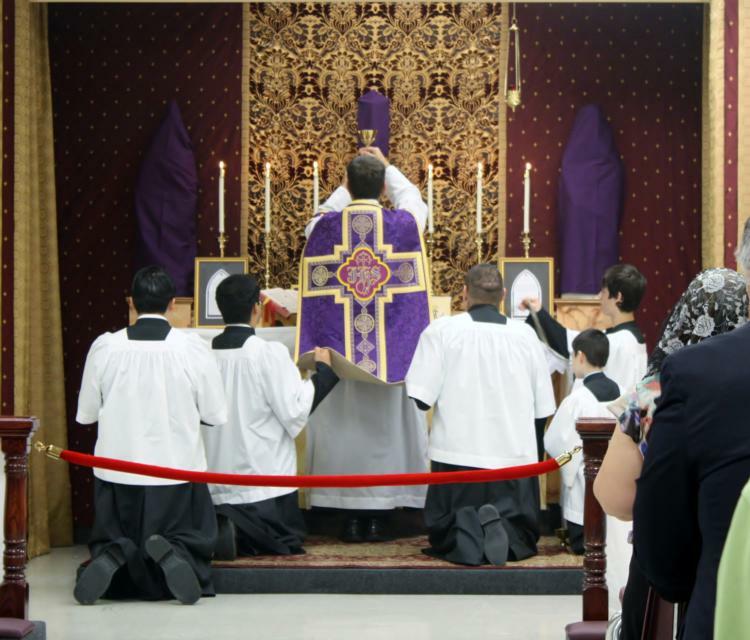 A few days before he was scheduled to leave, news came that the parish would be officially erected in the Archdiocese on August 15, two days after his return. Father boarded the plane, placing his trust in God and us that all would be arranged satisfactorily. Frs. Paul Lockey and Kenneth Walker, FSSP served in his absence. Fr. Walker arrived from Phoenix, Arizona, trading dry heat for humidity. Read About Fr. Kenneth Walker located to the left under Documents. For more information, please read Mass of Thanksgiving. Consecutive feast days: Corpus Christi on Thursday May 30, Regina Caeli (Queenship of the Blessed Virgin Mary) on May 31, and the External Solemnity of Corpus Christi two days later. The procession of the Blessed Sacrament on Thursday (pictures above), was to be followed on Sunday by a more elaborate external procession in which the First Communicants and their fathers would assist. Pounding rain on Sunday nixed it, and the First Communicants participated in an internal procession instead. 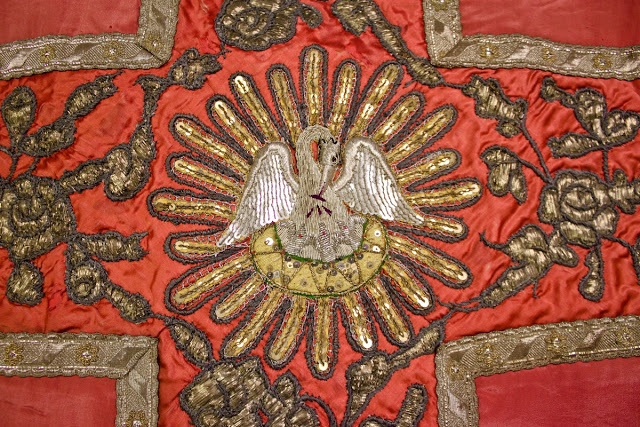 The antique monstrance used in the processions was a gift to the parish. Its ornate design includes a crown of thorns that encircles the glass luna that holds Our Lord. The rose petals that couldn&apos;t be dropped before the Blessed Sacrament were donated for use in a later procession. The parish reception after Mass celebrated the back-to-back feasts with a decorated round cake for Corpus Christi and cookies in the shape of crowns for Regina Caeli. More pictures at the External Solemnity of Corpus Christi Photo Album located at the top of the page. "Benedicta et venerabilis es, Virgo Maria"
May, the month of Our Lady, and many blessings to the parish! The May Crowning was a sun-kissed day that banished the chill of the night before. Soon-to-be First Communicants lead the presentation of the flowers to Our Blessed Mother as the Ladies&apos; Choir, re-grouped under Molly Tipps, sang beautiful Marian hymns. Ascension Thursday followed on May 9, and on May 12, Mother’s Day, the lower level CCD students received First Communion at the High Mass. Congratulations to Patricia, Joseph, P.D., Joaquin and Ruth! In his sermons the first two Sundays of the month, Fr. Van Vliet spoke of the special honor and love due Our Lady and the reasons thereof, and the even higher love and devotion due to our Lord Jesus Christ, most especially when receiving Him in Holy Communion. More pictures at May Crowning/First Communion Photo Album located at the top of the page. "Ego conjungo vos in matrimonium ..."
Congratulations to newlyweds Michael and Kayleigh Bumbarger and Manoj and Elizabeth Kurian! 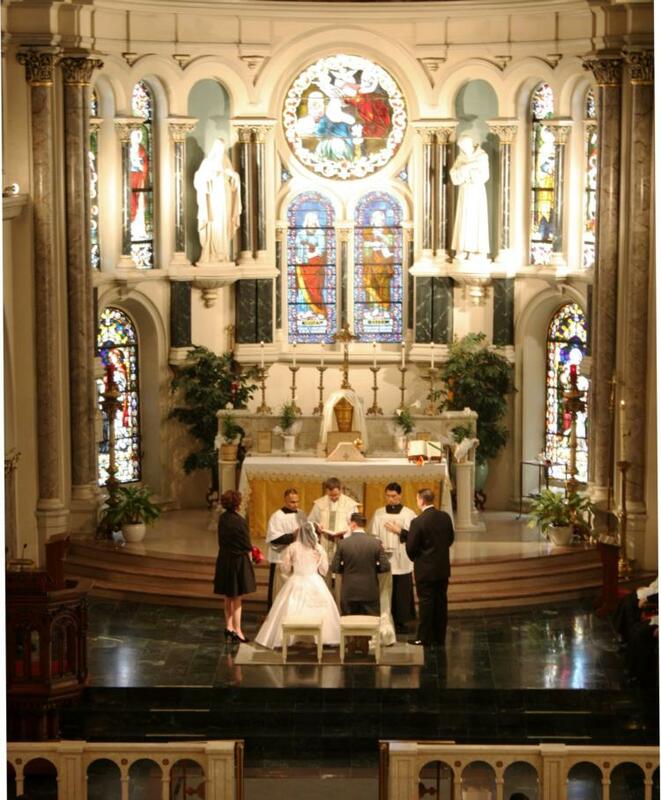 They were the first couples to enter into our parish pre-cana program, and were married by Fr. Van Vliet in a Nuptial High Mass and Solemn Mass, respectively. The church is Annunciation Church, Houston. April 4, 2013 Movie Screening: "The War of the Vendée"
Read about the movie screening of "The War of the Vendée". Holy Week opened with blustery winds and cooler temperatures, but ended with warmer weather and a much needed thunderstorm on Easter afternoon. During the Palm Sunday processional, swirling winds pushed the palm leaves on the cross into forward spikes (please see the pictures). 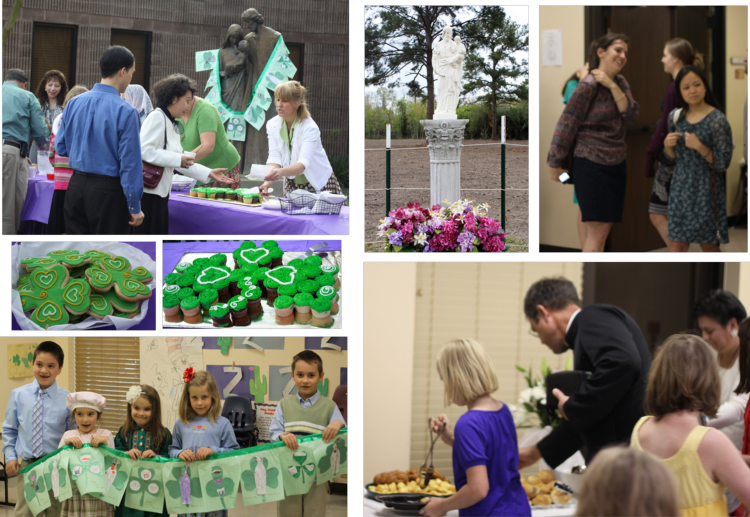 This was our second Easter in the FLC, and like last year, Father surprised the parish with a much appreciated change. We now have a portable confessional, with dark screen and kneeler! Modified and re-finished, the donated confessional is set up in a small room off the main FLC room for confessions before Mass. It was first used on Holy Thursday. Those who came to the High Mass on Easter Sunday got an extra surprise: a violin solo by John Paul Wiechkoske during Communion. Lent was unusual this year. Joy kept bubbling up during this penitential season of mortification: the visit of Fr. Flood, FSSP District Superior of North America, on the first Sunday of Lent, the election of a Pope Francis I on March 13, the March 17th feast day of St. Patrick conveniently falling on a Sunday (luck of the Irish! ), and of course the feast day of our beloved St. Joseph on March 19 and the papal inauguration. 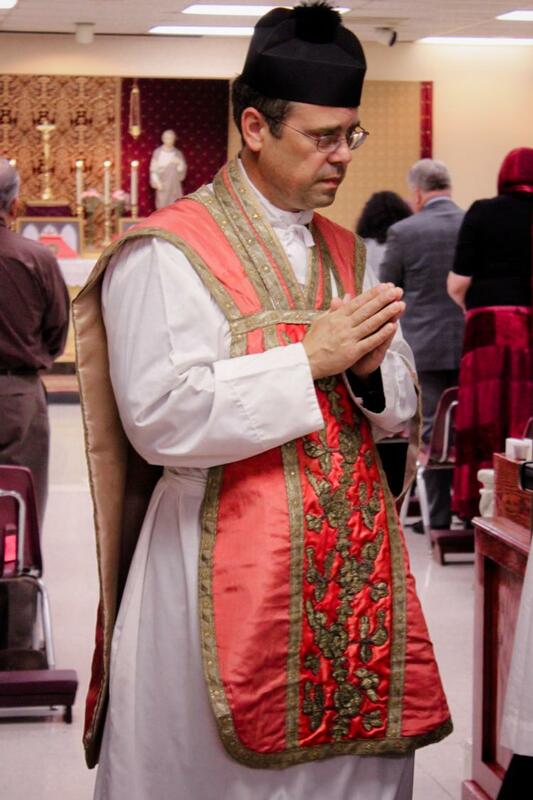 On a more personal note, Father and the parish received a pleasant surprise when his rose vestments were featured in an article on the New Liturgical Movement website (please click here to read). At 8:12 p.m. Rome time, Jean-Louis Cardinal Tauran announced, "Habemus papam!" Jorge Mario Cardinal Bergoglio, Archbishop of Buenos Aires, was elected Supreme Pontiff of the Holy Roman Church and took the name Francis I. His papal inaugration was held on March 19, 2013. For the official biography of His Holiness Pope Francis, please click here. Fr. Eric Flood, District Superior of North America, arrived late Friday from wintry Elmhurst, PA to brisk sunny Houston. Saturday&apos;s task: bless the bulldozer! Delivered on site that morning by Jim Kubik of Baytown Ace Machinery, Ltd.; used immediately by Fr. Van Vliet on the south half of the property. In other areas, men used chain saws to cut dead trees. Women and children helped carry branches to the burn pile and assisted in the care of the baby lambs. Exhausted, everyone was grateful for the hearty lunch of Mexican food. The following day, Fr. 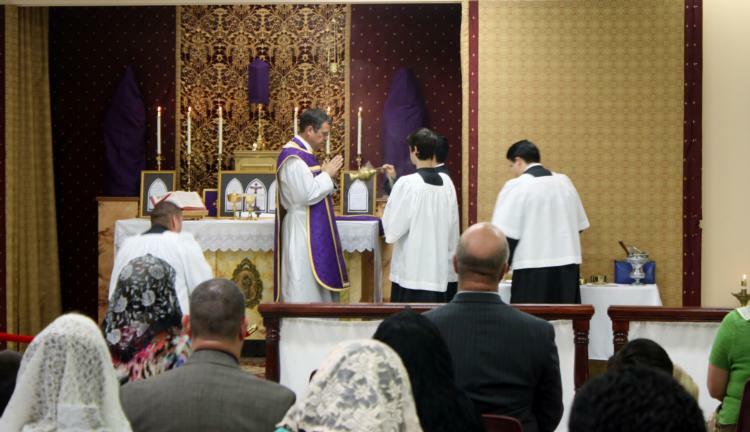 Flood celebrated High Mass in the FLC, and met with parishioners at the reception held between the Masses. Sermon for the First Sunday of Lent: the ten commandments and six precepts of Satan. Exhortamur vos, ne in vacuum gratiam Dei recipiatis. More pictures at Fr. Flood Visits, February 2013 Photo Album located at the top of the page. Read About Fr. 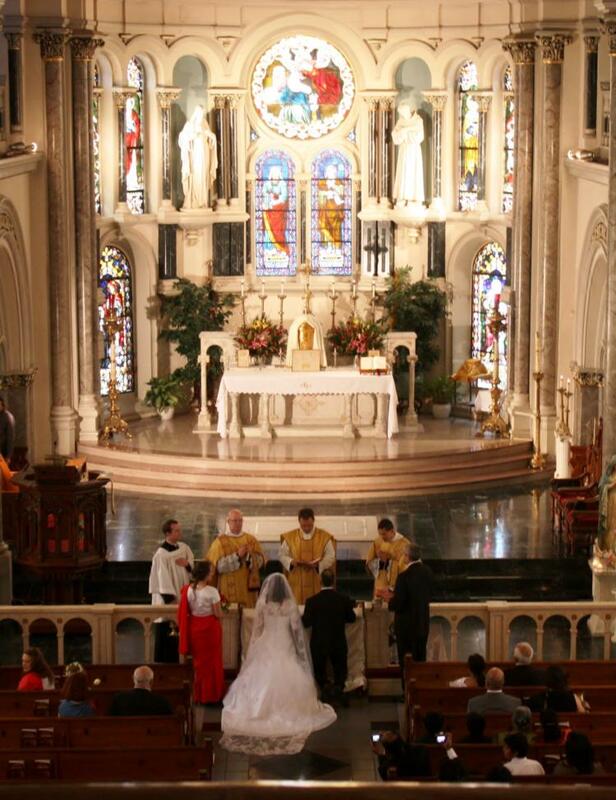 Eric Flood, FSSP located at the bottom of the page under Documents. "Vade, satana ... . Da locum Christo ...."
Saturday evening, black skies and thunderstorms as Fr. Van Vliet chanted: Exorcizamus te, omnis immunde spiritus .... So began the exorcism against Satan and his legions, followed by the exorcism of the salt and water. The Epiphany water and chalk were later used in the blessing of homes. Fr. Van Vliet, with the assistance of Daniel Bui and John Burford, travelled to some of the homes for the blessings. After Mass on Sunday, the Epiphany was celebrated in the Mexican tradition with king&apos;s cakes, fruit, and chocolate milk in lieu of hot chocolate. Three kings, provided by the Leyva Family, were placed in the center of the main table but there was no Baby Jesus for them to adore. Fr. Van Vliet quickly rectified the situation, by placing Baby Jesus in their midst. More pictures of the Feast of Epiphany, 2013 and Epiphany Blessing of Homes, 2013 Photo Albums at the top of the page. Read about Blessing of the Epiphany Water and Homes.